The monthlong celebration includes a parade, street fair and a bike ride in La Conner, Mount Vernon and surrounding areas. To help you plan your visit, the Tulip Festival updates its online bloom calendar daily, showing which fields in the area are in bloom. Display gardens in the two main festival venues, RoozenGaarde and Tulip Town, have flowers in bloom all month. The acres of tulip fields near the gardens and around the Skagit Valley are expected to bloom around April 8 and the few weeks beyond. Daffodil fields that have been in bloom for weeks should still be colorful through the first week of April. Fields of daffodils are left intact through their bloom cycle, though their color fades, unlike tulips that are “topped” toward the end of their bloom cycle to strengthen the bulbs. Time: 9 a.m. to 5 p.m. daily through April. Location: 311 W. Kincaid St., Mount Vernon. More info: 360-428-5959 or tulipfestival.org. Time: 9 a.m. to 7 p.m. daily through April. Cost: $6-$7, ages 5 and younger free; includes parking at off-site RoozenGaarde fields. Location: 15867 Beaver Marsh Road, Mount Vernon. Time: 9 a.m. to 5 p.m. daily, later if weather permits, until end of blooms. Cost: $7, ages 5 and younger free. Location: 15002 Bradshaw Road, Mount Vernon. More info: 360-424-8153 or tuliptown.com. Time: 2 p.m. April 8. Location: First Street, La Conner. Time: 5-mile run and 2-mile run/walk, 9:30 a.m. April 8. Cost: $20-$40, ages 10 and younger and 70 and older free. Location: Skagit Regional Airport, Burlington. Time: Register 7 a.m. to noon, course open until 4 p.m. April 15; 20-, 40-, 60-mile routes. Cost: $35/advance, $40/day of event, ages 14 and younger free, benefits Safe Kids Northwest. Location: La Conner Middle School, 503 N. Sixth St., La Conner. Time: 10 a.m. to 6 p.m. April 21-22, 10 a.m. to 5 p.m. April 23. Location: First Street, Mount Vernon. More info: 360-336-3801 or mountvernondowntown.org. Time: 11 a.m. to 7 p.m. Saturday, April 1, through April 23. Location: Hillcrest Lodge, 1717 S. 13th St., Mount Vernon. More info: 360-428-7028 or kiwanisbbq.com. No matter when the tulip fields bloom, festival events at nurseries, wineries, restaurants, shops, museums, art venues and more in La Conner, Mount Vernon and the surrounding area continue throughout April. Popular events include the 30th annual Kiwanis Salmon Barbecue in Mount Vernon April 1-23, the Tulip Run on April 8 in Burlington, the La Conner Not So Impromptu Tulip Parade on April 8, Tulip Pedal bike ride on April 15 and the Tulip Festival Street Fair April 21-23 in Mount Vernon. Tulip Town and RoozenGaarde — with display gardens, tulips for sale, tulip fields and other attractions — are the main festival sites. RoozenGaarde, named for the Roozen family — who’ve been growing tulips since the 1700s in Holland and in Mount Vernon since 1947 — is the largest flower-bulb grower in North America, with 500 acres of daffodils, 350 acres of tulips and 150 acres of iris fields in the Skagit Valley. Tulip Town, also founded by an immigrant from Holland, has outdoor display gardens, an indoor flower show and trolley rides through the tulip fields, weather permitting. Tulip fields are open for walking; be sure to wear appropriate footwear since the fields are often muddy. The display gardens provide tidy, easy walks with up-close views of dozens of varieties of tulips and other flowers in bloom. No pets are allowed at either farm. 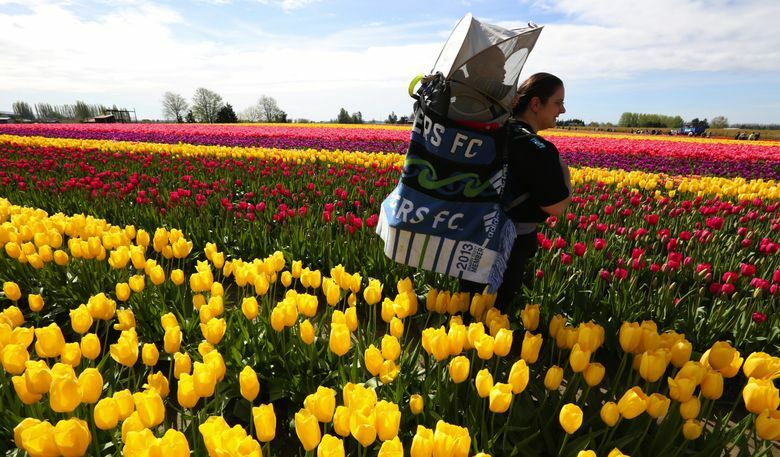 The Skagit Valley Tulip Festival draws fans from around the world each spring. Weekends are especially busy, often slowing traffic on two-lane country roads. Weekdays and early morning or late afternoon on weekends are usually less crowded. Drive-by viewing of blooming fields is the best option in many areas where parking is not available. The Tulip Festival office in downtown Mount Vernon is open daily with helpful information, brochures, maps and guides about the festival and other local attractions.